A Santa Ana resident named Tom Childress filed an appeal today of the Planning Commission’s approval of the CUP for the new Buffalo Wild Wings Restaurant that is slated to open up over by the Orchard Supply Hardware (OSH) store on 17th and Tustin, in Santa Ana. The appeal forces the Santa Ana City Council to have to conduct a full blown public hearing. I still think the restaurant is a good idea but apparently we will find out soon how the other residents of Santa Ana feel about it. This appeal is only for the after hours CUP (1 extra hour on Friday & Saturday). The other CUP for liquor is not appealable……it is a shame that a business that received 7-0 approval has to continue to fight to open a business in the city. I wish them luck and can’t wait to taste their wings, drink a beer and watch a game. I hope this time, as required by law, the City will notify residents of the public hearing whose property is within 300 feet of BWW. Just one more case of SA snookering a business and expecting the residents to roll over and just take it. I imagine that neither party could feel really great about this controversy. Good luck on the fight, Mike. The issue is much bigger than the BWW. It’s a question of the City Planners subverting the processes to the benefit of the developer. It’s a question of whether or not the City Council as appointed by the people are going to make the decisions or are the Administrators going to. The original approval of the project went through great pains to find a balance between the residents and the developer. The City Council ultimately approved it. Now 10 years later, the planning Department completely disregards the City Council and all participants by approving significant changes to the plan to the detriment of those who live nearby and ultimately to the developer himself. Rogue Planning departments always get themselves into this predicament. It becomes a power trip. That is why we have the policies in place to prevent that. I’m NOT for the noxious fumes that we are now subjected to, I’m NOT for the late night noise, I’m Not for having my existence put into shade so a developer can make a buck. I’m also NOT for having the Planning Department religated to cheif decision makers and the rest of us including City Council be told to go pound sand. Those of you who can’t understand this need to kick it up a notch. BWW is just a by product of a rogue system that disregards us all.You should be insensed. According to the muni code, the City Council – at it’s discretion and within 21 days of the Planning Commission’s decision – could reset the alcohol CUP for a public hearing. I happen to live in the general area(The Redwoods) and I believe this development will be a great asset to the area. I don’t understand the fuss. You have two bars(The Fling and The Office) that are within walking distance to Meredith Parkwood and and one across from Portola Park(The Quill) and there has never beeen any problems with drunken drivers causing accidents in these neighborhoods, and two of the previous mentioned establishments serve ONLY alcohol in the evenings and are open until 2AM. The ONE accident ever to happen in my area because of a drunk driver was caused by a homeowner who drank too much at his own home, got in his car, sped off down 14th St., failed to turn onto Mabury and flew into the park and got his truck stuck between two trees. Stopping a restaurant or appealing 20 CUP’s would not have stopped this accident from happening. So what should we do now, check everyone who buys a home to be approved by the city council just incase they may possibly drive drunk and cause an accident? This is just much ado over nothing based on hyperbolic and misplaced fears and old fashioned NIMBYism. This will be a fine establishment and there will be NO problems to Meredith Parkwood. If the Fling hasn’t caused problems with hours until 2 AM, I don’t see this causing problems. It is good to hear from you my friend and neighbor. The main difference between Buffalo Wild Wings and the establishments which you mention is 300 (THREE HUNDRED) loud noisy people and their vehicles. Drunk Drivers are a concern with the location of this establishment. Look at the traffic pattern. People leaving BWW must turn right due to the traffic island. Their first opportunity to go another direction is at 17th & Sherry. Those wishing to go north to Santa Clara or to return to Tustin Ave without dealing with traffic lights and patroling police will make our neighborhood their route of choice. It is only a matter of time before a kid gets it. Who wants to sacrifice their kid so we can have a mega sports bar around the block? Brad, I dont think soliciting volunteers for minor sacrifice is even legal anymore. Thanks for proving my point on Hyperbole. This hasn’t happened with two bars operating for nearly 40 years in the area and it won’t happen now. Still sounds like the only thing needed is a soundwall. The EIR for this project is over 10 years old. There are significant changes from the original plan. Number one, parking is now in the rear of the building – over 100 spaces. The plans were changed, there will be a significant noise increase from people and cars in the rear of the bulding. Additionally, the CEQA exemption the City is claiming, in order to avoid a new EIR, is based on a modification to an existing structure. That is not true – this was an empty field. Basically, the City is saying that they can violate laws and regulations and anyone who doesn’t like it can sue them. Sounds like you understand CEQA so I have a few questions. What “previously identified signifigant impacts” have changed as a result of this approval? What mitigation measures were required under the EIR to mitigate those impacts. What information do you have that shows this changed plan has any measurable change to the previously identified impacts other than your opinion? Any idea what the increase will be in CNEL’s (noise), Air quality, traffic or other impacts? Under this provision of CEQA, you must have more than just an idea to require a new EIR. Your comment sounds as if you work for the CORRUPT City of Santa Ana Planning Department. I know that parking was originally designed to be in the front of the building. And I know that the residents lives will be made that much worse by having 100 cars park in the rear of the building, regardless of supposed mitigation measures. I know that a still to be defined traffic gate, to restrict after hours parking, may or may not be effective. I know that there is some sort of fence mitigation specified which has also not been defined. I do not know if BWW will be able to meet parking requirements, taking into consideration the other 8 restaurants and many other businesses who use the front parking. I know that there is no reason for a sports bar to be open past 11:00 pm. I know that a City Planner, at a City Council meeting, indicated that his department was in the pocket of this developer. I know when residents of a neighborhood are being taken advantage of by an unscrupulous bureaucracy. I know that the residents of these neighborhoods will come out in force, to the City Council meeting at which this CUP will be heard, to let the Council know that we will defend our neighborhood. You and I both know that Matt simply misspoke and he at no time indicated that anyone is anybodies pocket. To try and use this as a means of defending your position is cheap. Matt Foulkes is a loyal employee of the city who we as residents should be thankful for. I don’t think that continuing to hammer on him does anyone any good. Well your suggestion that I work for the city is far from accurate it is comical and your reluctance to answer the specific questions make it clear that you don’t have any. Other than a hunch, guess, accusations and of course claims that the developer has the city in their pocket, you failed to demonstrate that your arguments are anything more than irrational red-herring. I would love it if you could respond to my questions regarding your claim that the city violated CEQA and would appreciate you withholding your judgment of me just because I asked you a few questions. I think the affected residents deserve their hearing. It appears that someone in the city departments, did, in fact, circumvent the process of involving residents for this project. They certainly seem concerned about the CUP process. Let them have a say in the process. Please don’t insist that Santa Ana’s due process on developments and other projects remain at Banana Republic ruling expectations. Any of the surrounding cities play by the rules of keeping residents informed of impacts by businesses. Attacking residents who care about their neighborhoods is petty. Its wrongheaded to try and intimidate people to give up basic rights to be represented adequately. Your agenda is cleary not as a resident who wants a fair shake. You seem more about quashing dissent and pushing things through without due process. Speaking of developers just having their way with the city of Santa Ana with city employees as their accomplices and get away drivers: Why is that historic building still all torn up, tattered, dusty and just sitting around the center of town? I thought that developer PROMISED to take good care of that building and see to it that it was relocated and reassembled. Why is it okay for SA planning and development departments to allow the city to look like a place as unsightly as tiajuana with unfinished projects just rotting in the seasonal elements? Maybe their paychecks should be withheld until that mess gets cleaned up. Sean mentions a loyal city employee. Maybe loyalty should take a back seat to COMPETENCE IN REGARDS TO FIDUCIARY OVERSIGHT by employees for the good of all residents of Santa Ana. Thanks for your analysis of my questions. I have simply asked my to justify his comments and answer my question. Nothing more nothing less. When anyone makes claims such as his they should be backed up. Like his claim that the city is in the pocket of the developer, that is a very harsh accusation. Indeed anonymous, I made a very harsh accusation against the City – and I stand by it. Call me I will relate to you, from repeated personal experiences, how this City is in the pockets of developers. In regard to the questions you posed to me in comment no. 14. I do not have the answers. I am not a City Planner or developer who is willing to ruin a neighborhood in pursuit of additional tax revenue. You knew the right questions – do you have the answers? Will you help defend the neighborhood? It seemed to me that Mike gave a pretty good shot at telling you what he thought the issues were. How will he and his neighbors “really” know what all needs to be discussed until the appeal process lays it all out? This guy, Mike, is acting like he’s in Irvine. He’s calling for accounntability and for his neighborhood to be treated reasonably. If he were actually IN Irvine, these meetings would have been held BEFORE the deal was inked with the business. Responsive city govenments do things like that. I know it must seem like a foreign concept, given SA’s governing history. SA is going to get it right. Some day. In the meantime, city employees are going to have to take heat if they cannot even involve the impacted residents in initial planning stages. If the city had tricked BWW into installing the business in a poor neighborhood with lots of slumlord apartments, then there would probably be a lot less citizen resistance. Like the Willowick development. The city employees work FOR the residents. The city should do an inservice on this concept. It would be a refreshing change to have a SA city goverment that was more altruistic, and less me-me-me, lazy-lazy-lazy, backroom deals mentality. Wow. I’m commenter #25 on a public debate about whether or not there should be a public debate on this issue. Of course there should. Abutters have rights too. On the other hand, I think the neighborhood concerns are overblown, but that’s what the hearing is intended to address, so let’s talk it out and come to a compromise. There’s no sense in having this process be so adversarial. Whoever it was that said that no sports bar should be open past 11 is insane. Many games go past 11, but more importantly, most bars are open until 2am, so I’d say your argument is petty and arbitrary. Furthermore, if people are really concerned about drunk drivers, why would they rather have them on the road at 11pm than 2am when there is less traffic and most of the kiddies are asleep? Duh. Build a sound wall and call it a deal, huh? If you have to build a sound wall, doesn’t that clue you in by now that the use is not compatible with the surrounding neighborhood? This a new project with new construction, there is no excuse to shoe horn this obnoxious use. Is this really the ONLY site in town that he can find? If the City wants another bar so badly they can help him find a better place. I know that there is an empty restaraunt near the Ramada Inn on frist street right near DMV. Great location for it!! Good access, existing facility, hotels nearby. There is “no parking” behind OSH, just an ally way. the building that will house the bar and other business, will have an ally way the same width as OSH. Exactly where is the questionable parking located? It will be tucked under the building in the rear as a semi enclosed structure. It will be an echo chamber for some 50+cars and concentrated auto emissions for us to share! Thanks, I understand your concerns now. The neighborhood affected by the Buffalo Wild Wings sports bar received some good news today. BWW has dropped their application for an after hours conditional use permit. However, this sports bar will rattle the nerves of SA residents until 12:00 am closing time – and after with employees departing. Does anyone know when BWW is scheduled to open? Man, it sure is difficult for me to fathom the blindsighted, moronic conclusions drawn by idiots that know nothing more about what they speak than being led by their own, shallow emotions. I speak of those that cry out IN FAVOR of the “Buffalo Wild Wings” eatery and Sports Bar that is slated to open this summer in the new buildings located in the OSH Center on E. 17th St.
How many “in favor of” have researched THIS ENTIRE SCENARIO? This means more than merely looking at the surface of things and judging ONLY from what it all APPEARS to be. Let’s e honest now, how many have researched the Codes, Ordinances that apply to the LAWFUL construction of the buildings? 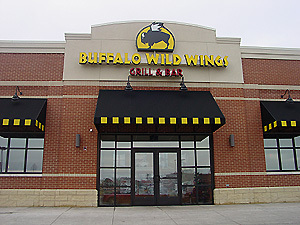 How many have researched whether the placement of “BWW Bar and Gril” IN THAT location is completely lawful and compatible with the community at large? Were any Impact Studies carried out? Is the complex at that site commensurate with current EPA rulings? Will the existence of this “hard-liquor bar” bring with it ANY inherent danger to the immediate community? Take a break from the simplistic “one or two line baseless, biased comments above and then go to the words of Mr. Tom Childress, a concerned resident and long-time citizen of Santa Ana and you will quickly see the pains-taking research Mr. Childress has taken on. As a matter of fact, there are others of us that have put in our own research as well, but not nearly as in-depth as Tom’s. Suffice it to say these new buildings are no more than a big “white elephant” that are bound to ultimately fail, along with the businesses they house. Nothing more really needs to be said – not when you KNOW what you are talking about! Seek the reasons why on your own!